When working on wood components and wood in general, the process step “sanding” mostly plays a decisive role at the end of the value-added chain. With our profile sanding rollers FAPI-FLEX and FAPI-FLEX-PLUS we have successfully responded to the challenge in the woodworking industry to achieve a clean flexible fine wood or intermediate varnish sanding. With the use of these highly versatile tools wood components can be optimally machined or ground, with portable machines as well as automated machines. Our engineers and application application technicians are available for you at any time by phone or email. The profile sanding rollers FAPI-FLEX can be manufactured flexble to highly flexible by varying the spacing between the abrasive cloth flaps. The interaction between the special design of the abrasive cloth flaps and the special arrangement on the profile sanding roller have made the profile sanding rollers FAPI-FLEX a proven tool in woodworking companies for years. The profile sanding rollers FAPI-FLEX-PLUS are a further development of the profile sanding rollers FAPI-FLEX. With the profile sanding rollers FAPI-FLEX-PLUS, a support is achieved by the arrangement of up to three cloth flaps behind the abrasive cloth flap. This generated a more aggressive grinding by use of the profile sanding rollers FAPI-FLEX-PLUS. With the profile sanding rollers FAPI-FLEX-PLUS, the support flaps also increase the service life of the rollers, which makes the sanding process even more efficient. A prerequesite is, however, that an aggressive sanding of the wood components is desired. 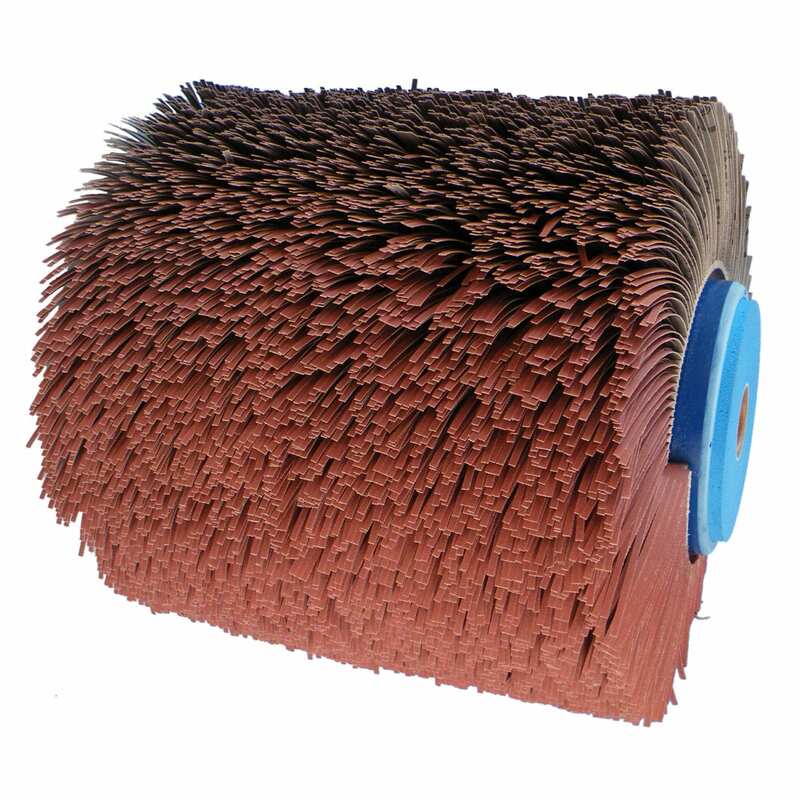 Use of abrasive cloth in various types of hardness ensures that the right profile sanding roller can be manufactured for every application. A wide variety of grain sizes. The grain size of the abrasive cloth for the profile sanding rollers FAPI-FLEX and FAPI-FLEX-PLUS can be selected individually. This ensures optimal results for wood and intermediate varnish sanding. Our profile sanding rollers are made with an explicitly developed offset in the flap structure which leaves an absolutely line free surface on the workpieces. 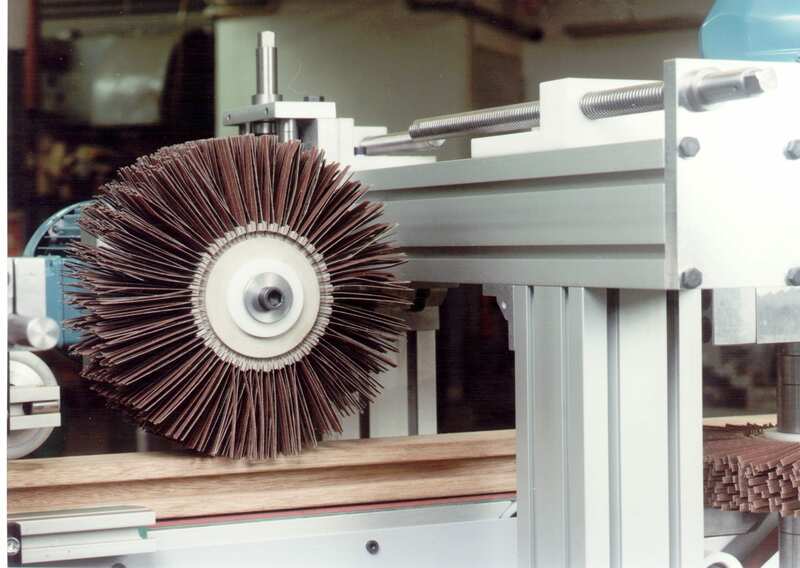 By plugging together or gluing together individual elements of profile sanding rolls, any required roll width can be produced to customer specifications. Our profile sanding rollers can be used on all stationary and portable machines provided for wood and intermediate varnish sanding by adjusting the location hole as required by the customer. 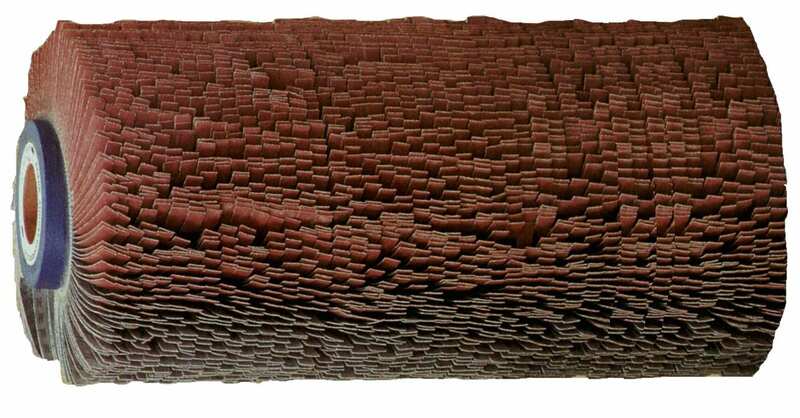 Indisputably optimum surface sanding results can be achieved with both profile sanding roller models, in contrast to the brush pattern provided by aluminium oxide or silicon carbide brushes. Highly diverse profile shapes can be ground in succession with our profile sanding rollers. 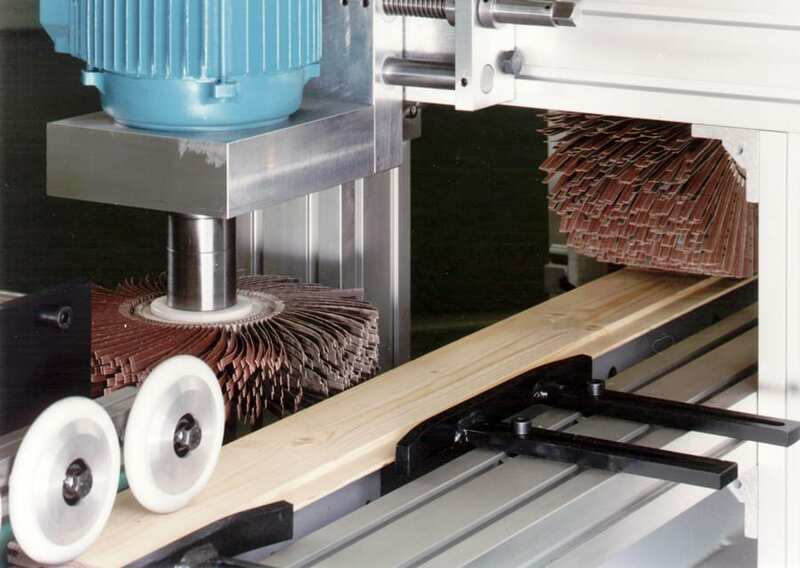 Retooling of the machine system is not necessary, like, for example, when working with profiled satin finishing wheels or aluminium oxide brushes. Flaps can be assembled on the profile sanding rollers so that they can be used on machines with alternating running directions. For example, Reckmann window sanding machines can be equipped with these adapted profile sanding rollers. Both the profile sanding rollers FAPI-FLEX and FAPI-FLEX-PLUS offer versatile use, because of their special design and because of the continuously slitted abrasive cloth flaps. For wood finishing, profile sanding rollers neither carve into soft wood nor leave comma formations on the wood surface. Wood finishing removes the fine wood fibres left after the sanding belt treatment and thus reduces not only the amount of base varnish required, but also provides a better surface for an optimum intermediate varnish sanding. Our profile sanding rollers are used primarily for wood and intermediate varnish sanding on slighty and strongly profiled and flat pieces, and narrow surfaces, such as mouldings, profiled boards, panels, furniture fronts, window profiles, profile mouldings, etc.. Please note that this is only a recommendation. We would be pleased to analyse your sanding process and provide you with an individual recommendation. We recommend using our profile sanding rollers at a cutting speed between 15 and 18 m/s. 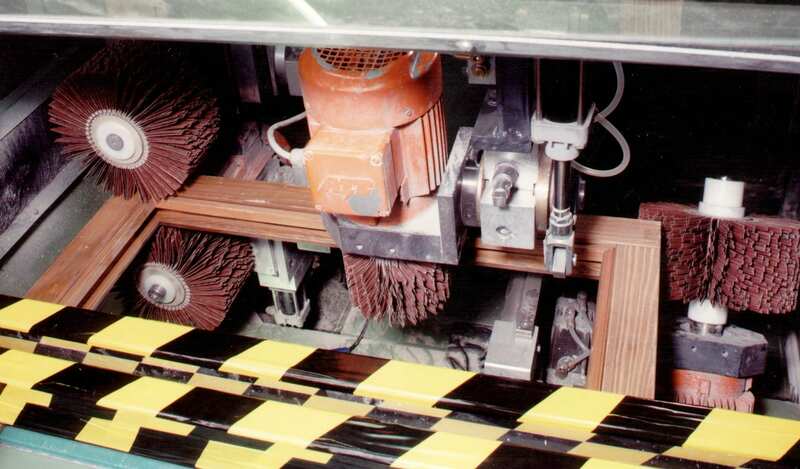 Normally the wood components are treated in counter rotation with our profile rollers. The feed speed is approx. 10 m/min per sanding unit.